« Do Angels really exist? TOKYO — The European Union and Japan on Tuesday signed a “landmark” free trade deal that comes as Washington imposes new tariffs and threatens a trade war with China. The EU — the world’s biggest single market with 28 countries and 500 million people — is trying to boost alliances in the face of Trump’s protectionist administration. The European Union (EU) and Japan have signed a trade deal that promises to eliminate 99 percent of tariffs that cost businesses in the EU and Japan nearly €1 billion ($1.17 billion) annually. 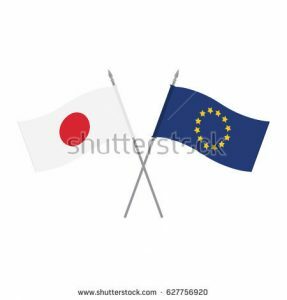 So, the EU has just concluded a major trade deal with Japan. The EU is working to make trade deals with many nations around the world. By doing so, the EU is also getting more of the world to accept its standards. This deal with Japan, like some other deals in progress, is sending a signal that the EU does not want the USA to get in the way of its growth and trade plans. This deal is expected to improve trade and increase wealth for both Europe and Japan. We are seeing the EU taking steps to dominate international trade. The deal with Japan is another step in that direction. Well, at least partially because of policies by US President Donald Trump, Europe and Japan are concerned that they will have less access to the U.S. market. So, they are looking to trade more together. Furthermore, since the old WCG article came out, we have seen the emergence of the European Union with Germany as its economic core. Japan is likely to be one of the nations that will benefit from this European-driven prosperity. We are now seeing Japan looking towards Europe for more trade. The world order is starting to change and the change will not end well for the USA (Daniel 11:39) nor its Anglo-Saxon descended allies (Daniel 8:24-25; Isaiah 17:3-4). The end of the Anglo-American order and dominance of world trade is getting closer. This entry was posted on Tuesday, July 17th, 2018 at 6:30 am	and is filed under Prophecy.